This research project focuses on developing a detailed computational model for the responses of auditory-nerve (AN) fibers in the normal and impaired auditory periphery. Modeling AN fiber responses provides a useful tool for testing our understanding of the underlying mechanical and physiological processes in the auditory periphery. Schematic diagram of the Zilany et al. 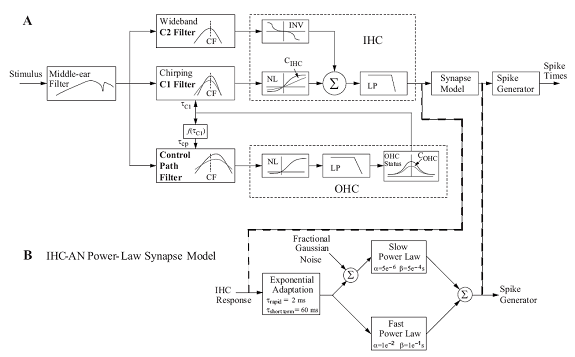 (JASA, 2009) computational model for auditory-nerve responses. Further, this model could be used to study the responses of fibers in ways that might not be feasible in physiological experiments. An accurate model of cochlear processing will lead to a deeper understanding of how the various physiological changes account for the variations in the neural responses associated with hearing impairment. The ability to break down an individual's hearing loss to its constituent components may enable us to design strategies that could restore the normal neural representation for listeners with hearing loss. Code for this model is available here. Researcher: Laurel H. Carney, Ph.D.
Auditory Neuroscience; neurophysiological, behavioral, and computational studies of hearing; signal processing for hearing aids.